Susan Holton Knitwear is just me - but, although you’ll see my knitwear on this website, you won’t see very much of me in person as I hate being photographed! I’m self-taught as a knitter and as a dyer. I began knitting more than 35 years ago, originally as a hand knitter, but when I discovered the incredible creative potential in domestic knitting machines I was hooked. My original degree and career was as a corporate graphic designer, but since 2000, my knitwear has been my full-time business. I’m very grateful to my earlier graphic design career for developing my obsessive attention to detail, which is crucial to the creation of really beautiful, top quality, well-finished knitwear. I want real women, with real lives, to be able to wear my knitwear everywhere, everyday (not just for best), and look and feel fabulous. I design and make everything in my home-studio near Hampton Court in Surrey. You won’t find my knitwear on the high street, and it’s unlikely you’ll ever see anyone else wearing anything remotely similar, unless you have a friend or family member who also likes my knitwear. Everything I make is crafted with meticulous attention to design detail and quality of finish, so garments fit and fabrics drape beautifully. My favourite yarns are silk, linen, cotton and viscose, which I knit and dye in various combinations. I use top quality yarns so I can create luxurious and long-lasting garments. I'm inspired by colours and textures. I explore stitch, yarn, fibre and colour by knitting experimental knitted and dyed samples to create the colour, texture and drape I’m looking for. I've been making garments for myself and others for more than 30 years; all of this experience in knitting, soft tailoring and bespoke garment creation helps me to create beautiful, wearable knitwear for my customers. My knitwear features innovative styling combined with a classic approach which doesn't date - I have customers who are still wearing and enjoying knitwear and accessories which they bought from me years ago. Many of my pieces are unique and no two are ever quite alike, and I have many repeat customers who come back time and again to build their collection of my knitwear, and to find much-loved gifts for friends and family. You can see more comments from my lovely customers on my reviews page, and on individual product pages. On 1 May 2016 my business was selected by entrepreneur Theo Paphitis as a winner of his #SBS (Small Business Sunday) award on Twitter. 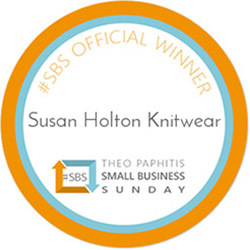 Every Sunday evening thousands of small businesses enter #SBS by sending Theo a tweet about their businesses; Theo chooses 6 winners each week. I entered unsuccessfully for about 18 months, and I was very proud when I was finally selected. Find out more here. Jacqueline Gold (CEO of Ann Summers) supports female-led small businesses with her #WOW (Women on Wednesday) competition. Jacqueline selects three winners from the many entries she receives each week. She looks for businesses offering quality products and excellent customer service, and I was delighted to be selected as one of her winners in 2015. You can find out more here. In 2004 when my knitwear business was still fairly new, I was selected as a member of Surrey Guild of Craftsmen. Selection is based on the quality of the work and it’s an accolade I’m very proud of. I continue to be an active Guild member and take part in the Guild’s occasional exhibitions and events.